We hung out with Kelly on a sunny Saturday and got a tour of her wardrobe. Kelly Trach is a Vancouverite that grew up in West Vancouver and currently lives downtown. She is a life and business coach that teaches self development through her podcast, online courses and 1:1 coaching. In her spare time, you can find her doing yoga, walking along the sea wall while listening to a podcast, cooking gluten-free plant-based food, and going on tropical destination vacations. 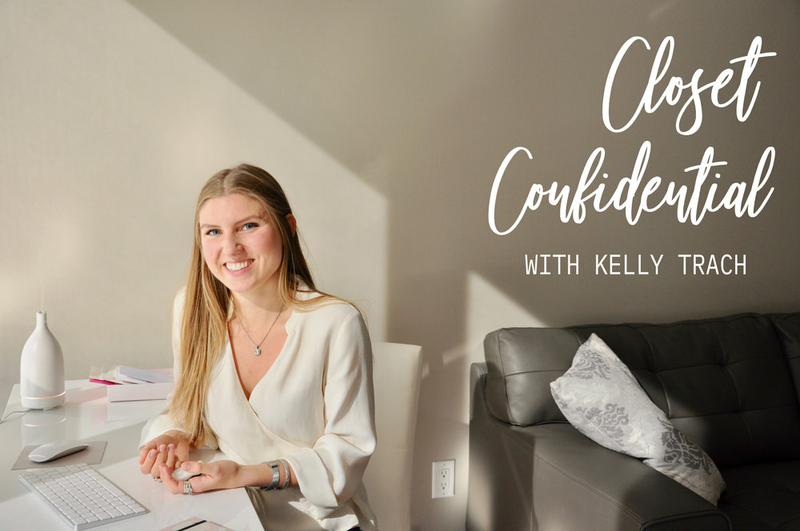 We’re in for a treat today, because we go into Kelly’s relatively minimal wardrobe, discuss how she went from 400+ items down to 83 pieces, and see how she leads a sustainable lifestyle in her own way. To kick things off, can you walk us through your closet? On the right side of my closet, I keep all my tops. From the center, it starts with the tank tops, moves to t-shirts and then to sweaters. On the left side, I keep my skirts and heavier jackets. These are some of my puffy winter coats! I decided to keep this interview very #IRL! I don’t hang my pants - they go in these bins and Amazon boxes at the bottom of my closet. On the very top, I keep fancier, event heels. I put shoes that I commonly wear down here too. What’s your current favourite item in your closet? My Chloe Faye is my favourite item and it gets the most wear! I wanted it for SO many years and finally took the plunge a few months ago. My community will know this, but it was a big deal for me to put down the cash for this bag. When I talked to my mom about pricing my latest course Your Conscious Empire, she asked me how much the Chloe Faye was, and we decided that my course (since it teaches you how to make money), is worth more than the Chloe Faye. That night after we had the discussion, I got the bag on The Real Real, an online luxury consignment store. I’m proud of myself for getting this bag because it was this was the first time I didn’t reward myself after accomplishing something - I treated myself to this bag during the process of creating Your Conscious Empire. That’s amazing and congratulations on the course - I know it’s been doing really well! Can you talk about why you decided to buy the bag from The Real Real? Yes of course! I got it from an online consignment store is because it’s more eco-friendly (I don’t buy new leather when possible since I don’t eat meat), and I saved some money buying it secondhand! What gets the most wear in your wardrobe? Definitely my jewelry! I never take my jewelry off (it comes with me to yoga, I workout and shower in it, etc.) so I only buy jewelry made from a pure metal (sterling silver, stainless steel, or gold) because it lasts longer. This is my watch I’ve had since high school - it’s from Saigon and I got it at the Bay. My silver bracelet is a gift from my mom from her Bali trip. The sterling silver ring with the jewel I got after coming back from studying abroad in Paris. That was such a transformative time in my life so I got myself something to commemorate it. The double silver ring is sterling silver and from a local artisan in West Van. My mom got it for my 17th birthday! This is a secondhand ring I purchased when I visited Australia. What is your most worn clothing item? This black dress from Aritzia! It always looks good on me and I love that it’s black so it doesn’t get dirty. I wear it to weddings, formal parties, casual outings - it’s just so versatile! I also filmed Your Conscious Empire in it so it has a special place in my heart. When you buy clothes, what’s the process you go through? I usually get something if I really want it. For example in the summer, I wanted a new dress and for fall, I wanted a wool v-neck sweater. Ultimately, I need to 100% love the clothing piece I’m purchasing and I don’t wait for sales anymore, as that makes it tempting to buy too many things. I also always check the fabric - I only buy 100% wool, silk, cashmere, cotton or polyester. For example, I don’t buy sweaters prone to pilling, as the garment has to last. Lastly, I live in neutral colours. My clothes are black, white, grey, beige, creams and then I have a bit of blue (eg: denim, baby blue) and light pink sprinkled throughout my wardrobe. A lot of my clothing is from Aritzia. I love that the brand is from Vancouver, the company releases a lot of timeless designs, and all their items are good quality so it lasts. Aritzia’s sizing is also consistent so I always know what my size is. Majority of my workout clothes are from Lululemon. 80% of my day to day clothing is from Aritzia, then I have some Club Monaco because I used to work there, and the remaining items I got secondhand, as I used to thrift a lot. Also, all my jeans are secondhand! I know you did a HUGE purge about a year ago. Tell us about that! Yes totally! I did one big purge, and then another one shortly after. I went through everything and was very cut throat. I sorted through my clothes, jewelry, accessories, socks, pyjamas, shoes, bags… and purged whatever didn’t serve me anymore. First dibs went to my mom or sister. 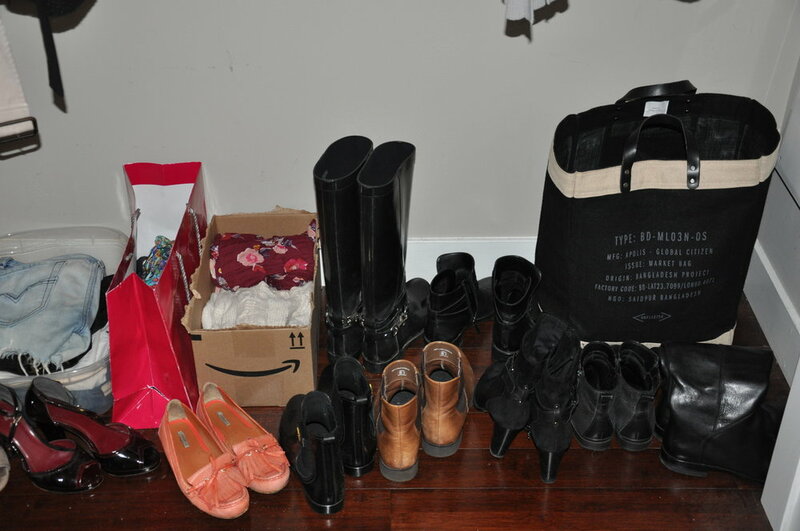 Then for higher quality pieces (eg: items from Aritzia), I sold them. For the remaining items, if it was decent quality, I gave it to the Salvation Army. Ultimately most of my items I gave to my family, sold, or donated. I went from ~400 items (10 garbage worth of clothing…!) down to 83 items now, which includes bathing suits, underwear, etc. I haven’t purged anything in nine months, as I did such a through job in my last two purges. If I need to remove anything in the future though, I will give it to my mom, sister, or sell it online. I had no idea that 90% of donated clothing end up in the landfill until I read Recloseted’s post! Moving forward, I’m going to be more conscious with my clothing disposal. How do you put together outfits using your relatively minimal wardrobe? Because I only buy my colour palette (black, white, grey, creams, bieges, blues and pinks), everything pairs really well together and I can easily make different outfits. I am okay with paying more for higher quality clothing pieces that are versatile. Ultimately, I like to “feel large and in charge”, as my favourite person Jen Sincero often says. Lastly, how would you describe your style and what advice would you give to help others figure out their fashion taste? I would describe my style as being timeless. I understand what looks good on my body and I always get a second opinion on expensive items. If you’re still figuring out your style, I recommend determining what’s flattering on your body, going on Pinterest to see what speaks to you, getting rid of all the crap you hate, and energetically clearing things to make room for new items. Also, for any entrepreneurs that work from home, don’t wear your sweats around the house! When I work on my business at my apartment, I dress like I’m going into an office, even if nobody sees me because it signals to myself that I am showing up for my business. tHANK YOU kelly FOR LETTING US INTO your WARDROBe and sharing your awesome tips with us! If you want to follow Kelly, you can find her @KellyTrach on Instagram, Facebook & Twitter. We also love her podcast The Kelly Trach Show and YouTube channel!